WASHINGTON, D.C. -- A recent study of currently enrolled college students by Gallup and Strada Education Network adds to previous research with college alumni on the importance of several key collegiate experiences that are associated with positive life outcomes such as wellbeing and workplace engagement. These experiences vary little by students' gender, and only somewhat by race or ethnicity, but those related to supportive relationships with professors and mentors are significantly more common in certain fields of study -- including arts and humanities -- than others. The survey of more than 32,000 undergraduates at 43 randomly selected universities in the U.S. finds that these experiences are associated with students' confidence that they will be successful in their career, experience wellbeing in their daily life and find value in the education they are getting. Given the link between these college experiences and positive outcomes, it is important to understand how these experiences vary across groups. Results from questions gauging support from professors and mentors vary substantially by students' broad fields of study. Those with majors in the arts and humanities (which include languages, literature, history, philosophy and the creative arts) are significantly more likely than those majoring in business, science and engineering, or the social sciences to strongly agree with each of three items, particularly having a professor who makes them excited about learning. These results are generally consistent with a previous analysis of corresponding items among alumni with different undergraduate majors. On a five-point scale, where 5 means strongly agree and 1 means strongly disagree, please rate your level of agreement with the following items. Percent "strongly agree"
My professors at [university] care about me as a person. I have at least one professor at [university] who makes me excited about learning. I have a mentor at [university] who encourages me to pursue my goals and dreams. Supportive relationships with professors and mentors are at least as strongly linked to confidence among students in other fields as they are with those in the arts and humanities. For example, regarding students' confidence that they will graduate with the knowledge and skills they need to be successful in the job market, the gap between those who strongly agree that their professors care about them and those who do not is even wider among those in business, the social sciences, and science and engineering majors than among arts and humanities students. Students' likelihood to report supportive relationships with faculty and mentors varies less substantially by gender or racial/ethnic background than by students' field of study. Men are slightly less likely than women to strongly agree with all three items. Regarding racial background, black and Asian students are somewhat less likely than white or Hispanic students to strongly agree that their professors care or that they have at least one professor who makes them excited about learning. However, first-generation students are about as likely as those with at least one parent who graduated from college to report supportive relationships with faculty and mentors. Notably, there are more substantial differences between black students and those from other racial backgrounds when the analysis is narrowed to arts and humanities majors only. While 43% of white arts and humanities majors strongly agree that their professors care about them as people, this figure falls to 26% among black arts and humanities majors. Similarly, black arts and humanities majors are significantly less likely than whites to say they have a professor who makes them excited about learning or and that they have a mentor who encourages them to pursue their goals and dreams. Results among Hispanic students in arts and humanities fields fall somewhere in between. The Strada-Gallup College Student Survey finds little difference by gender and modest differences by race and ethnicity regarding several collegiate experiences that consistently predict positive employment and wellbeing outcomes. Lack of significant variation by racial group is particularly noteworthy, as black and Hispanic students are overrepresented among groups considered at risk for dropping out, such as low-income and first-generation college students. However, the more pronounced differences in arts and humanities departments suggest greater attention should be paid to helping black students in those fields feel supported. 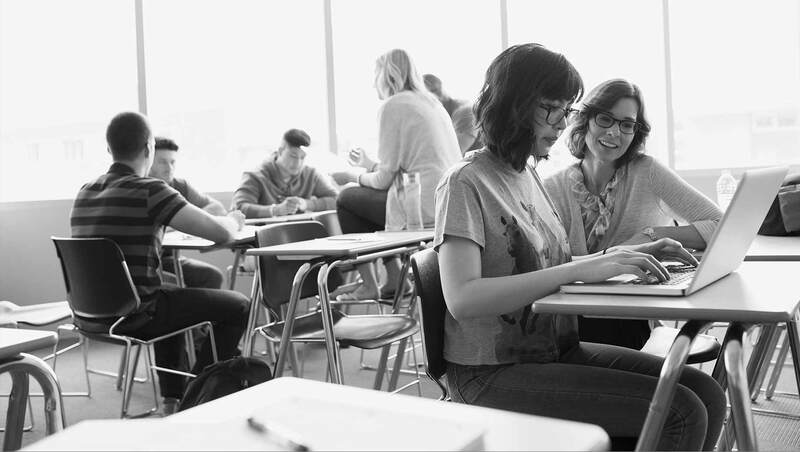 For many at-risk students, supportive relationships with professors and mentors may make the difference in terms of motivation and persistence. The more substantial differences by field of study, particularly regarding students' relationships with professors and mentors, offer food for thought. Smaller average class sizes are a likely factor in the more positive results among arts and humanities majors, particularly given that many attend smaller universities with higher faculty-to-student ratios. Among arts and humanities majors who attend institutions with 5,000 students or less, for example, 61% strongly agree that their professors care and 45% say they have a mentor; among arts and humanities majors at universities with 20,000 students or more, the corresponding figures are 28% and 26%, respectively. However, at least some of the variation by students' major is likely due to the expectations and attitudes of instructors in different fields; one prior study of college professors found that those in some disciplines (including communications, education and literature) assigned greater importance to developing rapport with students than those in others (such as chemistry and computer science). 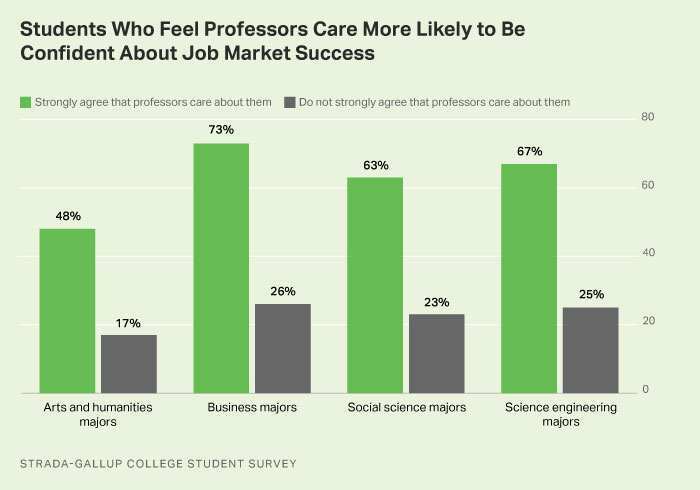 At a time when STEM jobs are in high demand in the labor market and STEM graduates report less regret over their major, it is striking that science and engineering major are less likely than other students to receive the personalized attention of professors. This is likely to be a problem for both the retention of STEM majors and the ease with which they transition into the workforce. In this case, STEM degree programs should be taking lessons from their colleagues in arts and humanities into how to enhance student experiences. Results for this survey are based on web surveys conducted March 21-May 8, 2017, as part of the Strada-Gallup College Student Survey of currently enrolled college students. Gallup randomly selected colleges and universities to participate in the study from the Integrated Postsecondary Education Data System (IPEDS). Colleges and universities were eligible for selection if they were degree-granting institutions awarding four-year degrees and if they were private not-for-profit and public colleges and universities. Forty-three universities participated in the study and provided Gallup email addresses for a random sample of all students enrolled either part or full time at their institution. Gallup sent an email invitation and a series of reminders to students to encourage participation. More information about the Strada-Gallup Alumni Survey (formerly the Gallup-Purdue Index study) can be found here. For results based on the total sample of 5,105 college alumni, the margin of sampling error is 2.2 percentage points at the 95% confidence level. All reported margins of sampling error include computed design effects for weighting. College grads view career-related advice provided by faculty and staff members as more helpful than advice provided by the career services offices. Professors are the most common source of mentorship at U.S. colleges and universities. Across academic disciplines, arts and humanities professors are the most likely to establish mentoring relationships with students.